If you’re one of those green smoothie-drinking, pre-sunrise spin class-doing people who still manages to be chirpy for a day at the office, we salute you. However, there’s no shame in needing a little bit of help when it comes to getting our recommended 30 minutes of exercise a day. We can’t promise to make that last circuit less painful, or the pool less chilly, but there’s one thing we can do, and that’s help you find the best gym bag for your needs. If you like to squeeze in a workout en-route to the office, look for a bag with separate shoe compartments to either keep funky gym shoes away from your business-casual best, or safely stow your smartest stilettos or brogues. Recognising the burgeoning trend of pre-work workouts, some manufacturers even make room for dedicated padded laptop compartments, so if you like to keep all your essentials in one place, keep an eye out for them in our list. Then, there are the uber-functional bags, the ones for muddy outdoor sports, camping trips, and anything else you can throw at them. There are convertible straps for turning a duffel into a backpack in a flash, generous capacities for packing everything but the kitchen sink, and weather-proof constructions for outdoor pursuits. Whatever your style, there’s a sturdy and stylish gym bag for you — keep reading to find your favourite. The elegant look, low-key branding and contrast leather-look straps are the key to this bag’s commuter-cool charm, but its surprisingly large 42.5 litre capacity and handy shoe compartment also make it perfect for hitting the gym before work and keeping your change of clothes to hand. Fashionable and functional, the nylon material is pretty easy to clean too. For anyone looking for a gym bag that won't look out of place being taken to work, this is a sturdy, stylish choice. If you pack light for your gym session or exercise class, this small sports bag is the one for you. It outwits even tiny lockers with its compact construction, and keeps things in line on the inside with a large vented pocket for worn kit or shoes and two extras for organisation. With its exterior waterproofing and under-seat-friendly size, it’s also ideal for on the road, fitting just the right amount for a night away from home. Great value and versatile, but might be too-small for heavier packers. 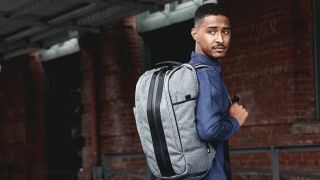 It might have been designed as a golf bag, but this top-loading backpack is equally useful for trips to and from the gym. For starters, it’s ideal for those who prefer a rucksack to a traditional over-the-shoulder or duffel-style sports bag, and for people who cycle to their sessions. Its zip shoe compartment is also a handy feature, keeping muddy soles off fresh post-class clothes, and the durable polyester construction means it’ll last and last. When you summon up an image of the classic gym bag, chances are you’re thinking of the Nike Brasilia. Its sporty style looks great on the road or in the locker room, and its structure and tough polyester fabric mean it can take a beating. If you like the convertible carry options of the North Face Base Camp bag, but don’t need the huge capacity, or don’t have room in the budget, go for this little gem. This inexpensive bag isn’t the sleekest on our list, but for the less-frequent gym-goer, it’s an excellent budget buy from a trusted brand. It’s sturdy and hard-wearing, especially on the bottom, where many other lower-end bags tend to cut corners, and has a padded, adjustable shoulder strap and handles for comfortable carry. Another nice touch is the ventilated shoe compartment, just right for stashing boots after team sports, while the generous internal capacity means you can easily chuck the rest of your kit in, too. Keep up to date with the latest fitness trends, check out our list of the best fitness gadgets to accompany your workout.